This a long over due post! I cooked this meal for St Patrick’s Day weekend. So yes, I’m behind in my posts. Tax season is over once more and I’ve been doing a lot of catching up and getting things organised. It was so nice to have time to be outside and see sunlight. My office is windowless and joyless. Since I last posted we’ve been enjoying hosting our exchange student from Denmark. Who isn’t a fan of Danish food. What are the chances!? She loves Italian food but is willing to have me cook some Danish food here and there. She also fits in at our house very well. Very smart and a great sense of humour. It’s turning out to be a fabulous experience for all of us. Our student arrived on St Patrick’s Day weekend and I wanted share some of our traditions. But I also needed something that was easy to put together because I was working 6 days a week. The Dublin Coddle fit the bill. Of course I changed the way to do it a bit. Mainly to make this even easier and quicker to make. If you are inclined you can cook the bacon prior to assembling but it also works if you don’t. In an oven proof dish begin layering potatoes, carrots, onions, and garlic, all thinly sliced. Then layer thinly sliced sausages and bacon. I chose chorizo sausage for a bit of heat. Sprinkle with fresh parsley. Repeat the layers. Add beef or vegetable broth. At this point you can have it more stew like or not. I wanted it to have a more soup consistency so I added about 4 cups/32 oz of vegetable broth. Cover and bake until the vegetables soften. Remove from the oven and grate fresh cheddar cheese over the dish. Leave the cover off and bake until the top browns. Of course I completely forgot to bake the soda bread to go with this. Only remembered as I was serving the meal. That would have been a nice pairing. My husband and I have been enjoying exploring the bike paths that run through our area. I’m still surprised at how much I love biking. And it’s great along the shady paths with the little breeze we work up. Keeps the humidity off of us. Still tweaking the bike so it fits me better. I found a memory foam seat cover which eases the bumps we go over. Today I’m bringing the bike back to adjust the handle bars. My husband and I tried but damn if we couldn’t shift it. Of course after doing a ride we don’t want a heavy meal and to be frank I lack the energy to whip up anything complicated. Still building up the stamina! We bought some lovely new potatoes from the farmer’s market this past weekend and a potato salad is an easy thing to make before the ride. As my husband isn’t into things with mayo I decided to make an Italian potato salad. I made up the marinade first so the sundried tomatoes could soak a bit. I used the ratio 2:1 for olive oil and white balsamic vinegar. Whisk to bring the two ingredients together and add a couple of cloves of garlic chopped, a few teaspoons of fresh thyme, and sea salt and pepper to taste. Cook up the potatoes until soft, drain and add to the marinade. Some potatoes will soften and fluff a bit with this, more than others. The ones I bought definitely fluffed a bit. Stir to coat evenly in the marinade. Add chopped proscuitto, freshly grated parmesan, mozzarella, and fresh basil. Chill then serve. Though you could have it warm if you prefer. Prior to the ride I marinated steak with thyme, sea salt, pepper, garlic, olive oil, and white balsamic vinegar. Easy to grill up and dinner is ready in no time at all! I think it is time to give up the ghost where the garden is concerned at this point. With the exception of the hardy root veg and brussels sprouts we’re done and dusted. A couple of weeks ago I managed to find some tarragon still green in the garden which reminded me of a recipe I had printed out from allrecipes.com a few years ago. Looking at it again, I realised that I hadn’t followed it completely when I made it before. For one, it had honey. And a few other interesting things. But it does have vermouth which works really well with tarragon. I love beef stews, particularly with ale, but my husband sometimes finds them too heavy in flavour. This stew has a lot of flavour without the heaviness. A more refined rustic soup if that isn’t too much of an oxy moron! Dredge about a pound of stewing beef in flour and season it with sea salt and pepper. In a saucepan melt 2 tablespoons of butter. Brown the beef. 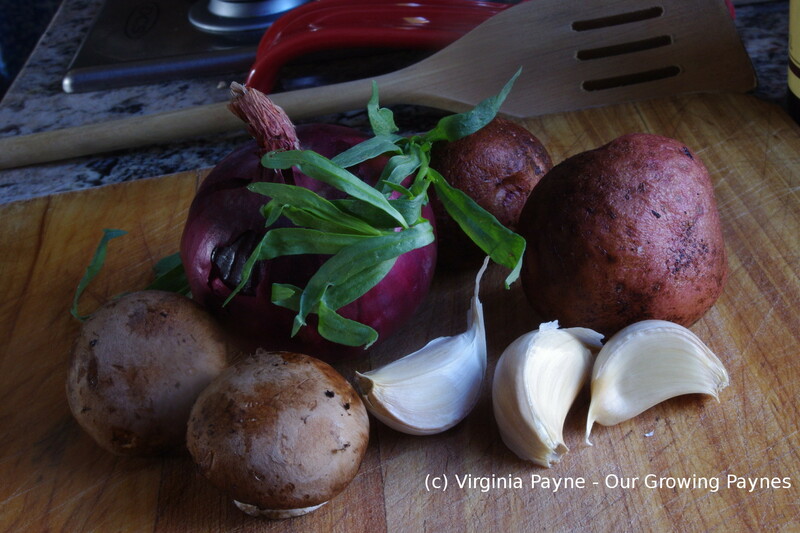 Chop a small red onion, 3-4 cloves of garlic, a carrot, and 2-3 mushrooms. Add the veg to the beef and cook for a few minutes. Cube 2-3 red potatoes depending on the size. Add it to the saucepan. Cook for a few minutes then add 4 cups of vegetable bouillon and bring to a simmer. Add 1/2 cup of vermouth, 4 tablespoons of worcestershire sauce, a handful of tarragon, and a small spoonful of mustard. Simmer for a few hours at low temperature until the beef is tender and the potatoes are cooked through.